July is the perfect month to talk about tools that are made in the USA. I had started a list about tools made in the USA in the TR forums but since I closed them down I thought I would bring the topic up again. I also tag all of the USA made tools I mention in articles with a Made in the USA tag and you can find that link in the sidebar to the right. When do I buy tools that are made in the USA? Whenever I can? The answer to that question is no, and I don't expect you all to buy American for everything. Sometimes there is no choice, or it is very difficult to buy an American made version of a product. Other times the price of American products are priced too high. But you might be surprised that many times the USA made tools can be priced very similarly to the imports. I gave some examples of this in the article Buying Quality Doesn't Have To Cost You. In general, if I am buying a one time use tool, I buy whatever tool is cheapest that will get the job done. If I am buying a tool that I am planing on using for years, I try to buy American if the price difference is within reason. This price difference is going to be different for everyone, but I urge you to take into consideration the value of supporting your fellow Americans during these times when the unemployment levels are so high. 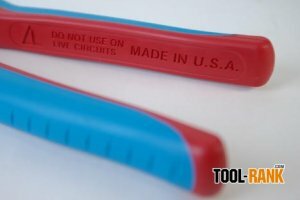 To find a great list of products that are made in the USA - including tools - check out AmericansWorking.com. They might not have everything listed but they have a good start, and you can submit tool brands that are missing.